Bet365 is one of the largest bookmakers in the UK. For Matched bettors, they can be a highly profitable bookie. Offering multiple ways to make a profit betting on your favourite sports such as football or horse racing. If you sign up to a Matched betting service, like the one I personally use, Profit Accumulator (totally free trial), you’ll find Bet365 to be one of the most profitable bookie accounts. From the first signing up offer through to it’s many reload offers and bet refunds. If you are totally new to matched betting be sure to check out my Beginners Matched Betting Guide. Matched Betting is not gambling. It is betting in such a way, placing 2 bets or more, so that all outcomes are covered. We could do this easily by utilising the lesser known lay betting. Usually, this incurs a very small loss, but you do it to gain a much bigger free bet or reward. Full instructions on how to profit from all these offers (plus many more) can be found at Profit Accumulator. Note: All offers below are subject to change at any time. If you notice obvious changes, please let me know in the comments. Risk-free does not mean there isn’t room for human error, so make sure you do everything correctly. For a few years the Bet365 Sports sign up offer was a large £200 deposit and sports bet with a wagering rollover if the bet won at the bookie. It was a very lucrative offer, but one which needed plenty of funds at both the bookie and the exchange. Plus when you’re starting out, £200 wagers can be a bit nerve-racking. I only mention this past offer here in case they go back to offering it or you have previously seen reference to it. Currently, the sign-up offer is a smaller and simpler one. Deposit and bet £100 and get a free £100 bet. Which is is still one of the biggest free bet offers you’ll find. The qualifying bet can currently be used on relatively low odds, which also helps increase overall profits as you have the option of a wider range of matches. You should be able to make a nice easy £70-£80 profit from this sign up offer alone. Advanced Tip: Before signing up to a bookie, always have a look to see if you can combine with the best cashback offer you can find. I’ve not seen one myself for Bet365, but that doesn’t mean there won’t always be one. Sign Up Offer Profit :£70-£80! The Bet365 individual football reloads are one of the easiest and most profitable offer in Matched Betting. Bet365 have tightened up a little over the last few months and you might find this offer invite only. When you know the offer is on be sure to check your emails. Typically, when the offer is on for a specified game, you place a £50 pre-match qualifying bet. Depending on how Bet365 work the offer, you either make use of a £50 risk-free in-play bet or receive a £50 free bet to use in-play on the match in question. Firstly, you place a pre-match qualifying Bet of £50. If for example, you find a close match of 1.80 at Bet365 and 1.82 at the exchange (I use Smarkets, only 2% commission and better for part matching bets). 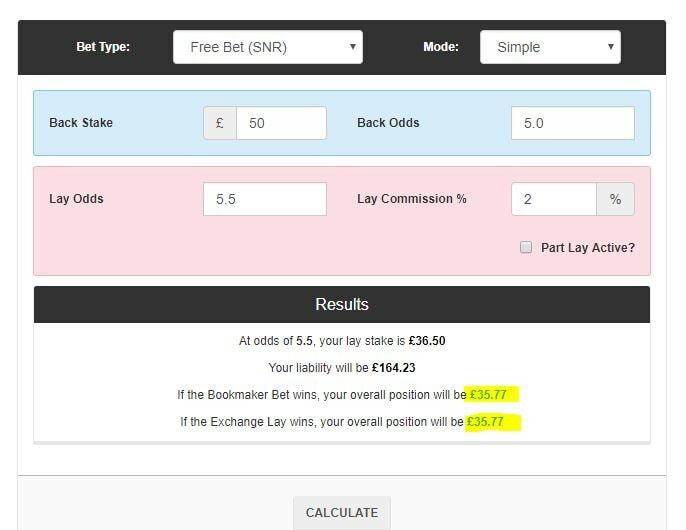 You can see in the calculator image below the qualifying loss is just £1.00. Once the game starts you would receive a £50 free bet (or if the old offer way you bet £50 0f your own money risk-free, if loses you get a cash refund) to be used in-play. Odds are constantly changing during a game and a goal could be scored at any time, changing the odds drastically. Therefore it’s a good idea to wait until half-time when the odds stabilise. If this is not possible, look for close matches on events that won’t be negatively affected by a goal, for example, “Both Teams To Score” or betting on “Over 2.5 Goals” etc. However, these won’t always have the closest matches so you’ll have to weigh up what’s best for you to do at the time. Risk-Free Inplay Offer Profit :£30-£35 each time the offer is available. Multiple times a year! Recently Bet365 have been offering early payout bets. What they do is pay the bet as a winning bet before the event has finished. So for a certain range of football matches, they pay out the team you bet on if your team goes 2 goals ahead. Or it might be a player 2 sets ahead in a men’s tennis match. You will have back bet at Bet365 on the event and then lay bet with an exchange, so if the result changes you can profit, and sometimes in a really big way. The extreme example would be if your team went 2 goals up and Bet365 payout your winnings. However, if the end result is a draw or the opposing team wins, you also win the lay bet at the exchange. S you win both bets and get your stakes back. This can result in a very large profit. Of course, that outcome happens rarely, however, even if your team is 2.0 up and the other team pulls 1 back you can cash out a portion of your exchange bet for a nice profit. You don’t have to wait for a totally different end result. Early Payout Profits: Totally varies, but profits can be huge if you outright win both bets, which is hit or miss, but there are lots of options for making a lower profit before the game ends if the result is going your way. Profit Accumulator members are making some excellent profits from this offer alone. Ways of approaching the offer are discussed in the forum as well as members helping each other out posting close matches. 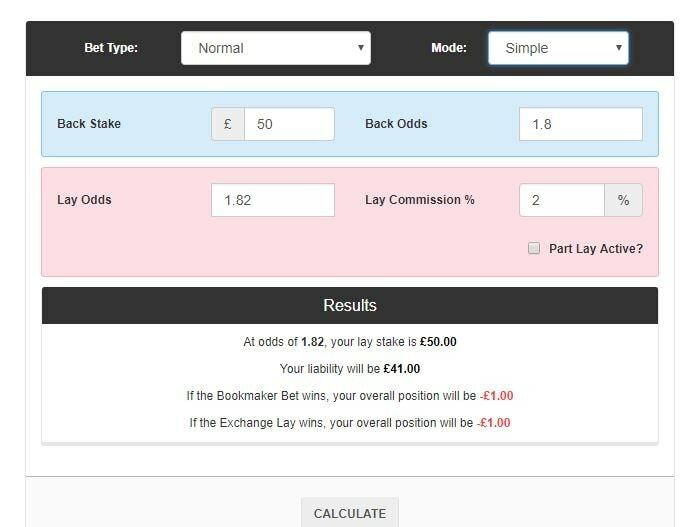 The Early Payout Calculator is ideal for helping you lock in a profit once an early payout has been triggered. Bet365 is one of the best Matched Betting Accounts for Horse refunds and along with the individual risk-free, in-play football bet reloads these are where the main profit is from your Bet365 account. On certain races each week, Bet365 offers a risk-free bet on the next race if you pick a winner of a race at odds over 5.0. They currently have this offer on 2 “Featured Races” on weekdays. If your horse wins the second race the risk-free bet carries over to the next Featured Race, be it that day or the next “featured Race” the following day. The ITV risk-free bet offer works exactly the same and usually covers 5-6 races on a Saturday or any other day there is ITV Racing. This offer is treated as a separate offer to the “Featured Races”, so if you win the last ITV race, you have to wait until the next ITV race on whatever day that may be to place your risk-free bet. Always double check offers on Profit Accumulator horse refunds page to see which races qualify. I did very well from this offer. My preferred way was the easy method of just trying to qualify for the refund. There is also a lock-in method which a earns small profit, usually of £4-£5 per race if you can find a close match. I only did on the ITV racing days (previously Channel 4). There is a lot of liquidity in the markets for the ITV races. Which basically means a lot of money in the exchanges so you can get close matches more easily. My own personal strategy was to typically aim for matches in the range of 5.0-8.0 . Sometimes I would go higher if I could get a really good match or there was nothing at all available at the lower odds. However, if you consistently choose the lower range of 5-8.0 you are aiming to qualify with more likely race winning contenders than 20.0 outsiders. Also, you need a lot of money in the exchange if you start going for higher odds matches. If you consistently choose matches in the lower range of 5-8.0 you are aiming to qualify with more likely race winning contenders than just getting close matches on any old 20.0 outsiders. Also, you need a lot of money in the exchange if you start going for higher odds matches at £50 stakes. If your horse wins, you get a risk free bet on the next race. Higher odds will gain you more profit, but it’s worth being aware that if you pick another winner with this risk free bet you get another risk free bet on the next race too. I preferred the races with fewer runners. Typically 6-8 or less, as you are in with a better chance than a field of 15-20 runners. Horse Refund Profit: £3-5 per race Lockin profit or £30+ each time you hit a winner and get a refund. For 2017 Bet365 did a very lucrative money-back bonus offers. They offered half the stake back on each-way bets up to £125. This offer alone offered Matched Bettors the chance to make £80+ pure profit. Bet365 may not repeat this exact offer, but it’s an example of Bet365 offering some of the best offers you will come across. If you didn’t already know, Cheltenham is the Horse Racing event of the year. 5 days of horse racing and 5 days of offers. With the ITV refund offer available every day there is plenty of chance to profit from this account alone. However, refunds can be hit a miss if you don’t end up picking the winners. Also, you need to be around to place the next bet or adjust pre-place bets. However, the easiest way to make big money is from the daily price boosts that Bet365 will have. With these you simply back and lay and make a profit. Keep an eye out on other offers like extra places that you can combine with the price boost. Cheltenham Profit: Could genuinely be hundreds of pounds across all Bet365 Cheltenham offers. In this post I provide a detailed breakdown of how I Made £750+ in 4 days from the Cheltenham Festival and tips on how you can profit too. Bet365 also offer a risk-risk free bet for certain Greyhounds races. Known as the “Sky Dogs 2/1 Offer”. If you back any dog over 3.0 on a specified race, you get a risk free bet up to £100 on the next live Sky Sports greyhound race. As with the horse risk-free bet offer, if the risk-free bet wins you also win another risk-free bet on the next race too! However, you’d be advised to be very careful as there is a lot less money bet on greyhounds so they are harder to lay at the exchange. Often, odds don’t go live until a few minutes before the races start. The odds move extremely quickly. Greyhounds are one of those events where you would most be better off building a profile with the bookie account as a Greyhounds punter. Otherwise, you will stand out as a bonus hunter. Again, you could do the lock-in method for this offer to make a couple of pounds profit per race. Greyhound Refund Profit: £3-5 per race Lockin profit or £30+ each time you hit a winner and get a refund. Bet365 typically offer a refund on certain pre-match markets if the games finish 0.0. Currently Correct Score, Half-Time/Full-Time results or Scorecast. There is no max refund however the amount of money is relatively low in the exchange. Odds are generally quite wide from bookie to exchange. However, if you mug bet on these markets, keep an eye out for hitting the refund. A price boost is when the bookie increases the odds on a bet for a short period of time, sometimes just a few minutes. You back at the bookie and lay at the lower odds at the exchange. Most commonly these boosts will be on horse races. During Cheltenham, I was making £6-£12 per boost from just £50-£75 stakes. Typically the lower the odds the more you can stake. Check terms at the time to see if you also qualify for other related offers. Price Boost Profits: £3- 12+ per boost. (Might be 4-5+ boosts on big race days). Matched Betting wise, Bet365 isn’t a bookie for profiting from accumulator bets. However, they are well worth placing as mug accumulators to increase the chances of keeping your account in good standing order. From doubles to trebles all the way up. Yes, this is some effort and a small loss each time, however, well worth considering to keep the account open. In addition to any offers advertised on the site, Bet365 may send you via email your own exclusive loyalty or deposit bonuses. I was sent a good few £10 loyalty bonuses as well as a few 25% deposit bonuses up to £25. Full instructions are sent in the email and you typically just have to log in and enter your unique Bet365 bonus code. Bet365 has various sign-up bonuses for its Casino and Vegas sections. Your risk appetite will decide whether these are right for you. One risk-free offer they have every so often is 10+ free spins. Typically you just have to deposit £10 or transfer existing £10 into the Casino to activate them on certain pre-specified slot games. In the past, there used to be no wagering requirements but recently they have changed to winning needing to be wager x20. However, it’s totally free opportunity and you never know you might get lucky while wagering. If you get into casino offers you may want to try the Bet365 Vegas offer. I won’t go into details now other than to say its quite a large deposit and the recommended slot game Bloodsuckers has a low paying bonus game which hits often, therefore time-consuming. If you get into doing casino offers, consider how you do it then. It all depends on your appetite for risk and variance. It’s also totally fine not to do the offer at all as you could lose your whole deposit. Again, check current offer details and have a look in the relevant offer forum thread for any extra tips. Bet365 have a VIP programme which is extremely lucrative. There are no set guidelines to be met and its invite only. It is not something I would recommend purposely aiming for, more a bonus if ever you achieve it. This members forum thread head details some of the activity a VIP member undertook while a VIP member and the various ways they were rewarded. It is quite possible over time you will be gubbed at Bet365. This when they email you to confirm you are no longer eligible for free bets and offers. With Bet365 when you are gubbed it tends to come with stake restrictions. You can still participate in some of the offers listed above, but for some, their won’t be much point if you can only stake £2-£5 even at low odds and less at higher odds. Stake restrictions appear individual so you won’t know how severely affected you are until it happens. Although quite rare, ungubbings have been reported. Check out the “Ungubbed Thread” in the Profit Accumulator. Over time they may also increase your stakes even without a full ungubbing. Gubbings aren’t the end of the world in Matched Betting, in fact for some bookie accounts I made more matched betting profit with bookies after a gubbing. It may well depend on your bank, but I personally found the withdrawals from Bet365 very simple and quick. This is useful if you win in the bookie and need to withdraw the money for other offers or to deposit some back into the exchange. As you can see there are many ways to profit from a Bet365 account. Whether you do any of the other offer types will depend totally on what you prefer doing as a Matched Bettor. Obviously, don’t go mad trying every offer as you will soon get your account closed.